We recently tested the Brunswick C-System maxxed-out. As usual, keep in mind that the coverstock will account for 70% of ball reaction while the core characteristics and drilling will dictate the shape of the reaction. Generally speaking, the intent of these layouts will be to get into an earlier roll and have a medium transition at the breakpoint with medium flare and good length overall. Brunswick seems to have definitively moved to balls with much more backend. This ball and the Nexxxus f(P+S) have blown the old hook and set reputation of the Big B right out of the water. This ball simply seemed very strong for both conditions we tested it on. I always scrutinize the value proposition on new balls considering how many good low end balls they are. This is a mid-priced ball and offers lots of movement on the lanes. The Maxxed-out uses the I-Block core with a RG of 2.523 and differential of 0.055 for a symmetrical shape. This core form has been used many times with slight variations to create varying motions. The previous Alpha-Max had a similarly named I-Block core, with slightly different numbers. Overall this core allows good length with a decided move on the backends. This ball uses the CFT Maxxed-Out solid coverstock. It seems to offer good midlane read while still allowing the ball to be quite punchy on the backends. The factory finish is 4000 Siaair micro pad. There seems to be a pretty good match up between cover and core. Some have complained about the longevity of the CFT cover on the Alpha-Max so hard to say how this cover will hold up. I usually avoid speculation on cover longevity but generally some equipment will require more maintenance than others. It’s going to take some time with this ball before we can say. 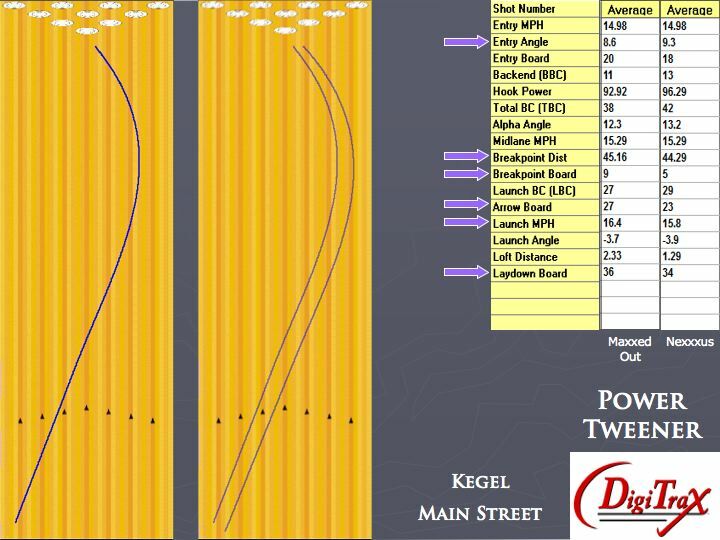 Overall, the Brunswick maxxed-out allowed for medium length, offering a consistent read in the midlane and a pretty aggressive move on the backends. It’s not too common to find a ball that seems too strong but doesn’t burn up. Usually strong balls will use up a lot of energy on medium or lighter conditions making them look like turds. This ball was strong and didn’t bleed any energy off really. It was just hard to keep right of the headpin because of how strong it was. You can see how deep Mikey had to throw this ball. Of course you will see variation. In a tighter section of the house, he was able to use the ball more easily. Keep in mind that Mikey is a high-rev bowler and so he will get more overall ball motion than most. The good thing is that you can tell exactly what the ball is going to do and you wouldn’t think this a mid-laney ball at all watching the motion. However, the hallmark of good control in the midlane is when you can’t blow it through the breakpoint. The maxxed-out doesn’t seem like a ball you can blow past the breakpoint very easily. When compared to the Nexxus f(P+R), the maxxed-out didn’t labor on the backend. The Nexxus had too much early and midlane strength but just labored a bit to turn over and get a strong hit. Not so with the maxxed-out. Compared to the Versa-Max, this ball is simply a ton stronger. The Versa-Max is more usable on medium THS conditions and didn’t need to be so deep in the USBC pattern. The Versa also offered a softer read and transition from midlane to backend. 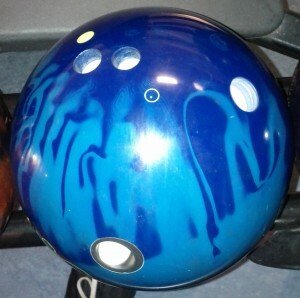 On the sport pattern, 2012 USBC Open, this ball also seemed too strong. Mikey was able to find a line to play, but he usually wouldn’t want to play that deep. Again, owing to the balls consistency, it grabbed the midlane and still had plenty of backend. First off, you can easily see from the Digitrax how strong the C-System maxxed-out is and what it is capable of. Again, Mikey has a fairly high rev rate, but the entry angles are quite frankly obscene. 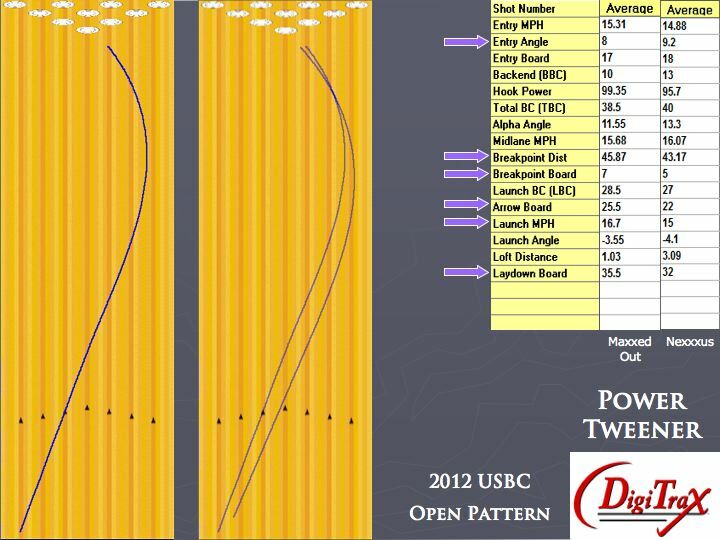 On the THS, he got 8.6 degrees while on the USBC sport pattern, he got 8 degrees. Let’s not address the Nexxxus in detail in this review. However, these two balls are not bad compliments to each other. 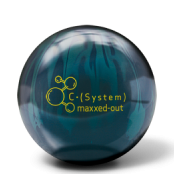 If you bowl on heavy or medium-heavy conditions that are on the tighter side, this symmetric cored Brunswick C-System maxxed-out will be a great option to offer a consistent ball reaction. It will read the midlane well and store plenty of energy for the backends. You’ll rarely blow through the breakpoint with this ball. If you have less hand than Mikey, you will likely be able to take advantage of the strengths of this ball on medium conditions as well. Very good offering at a very reasonable price point from Brunswick.